We're pleased to announce the garlic chart has been placed online this morning! Garlic is a much more versatile ingredient than many people think. 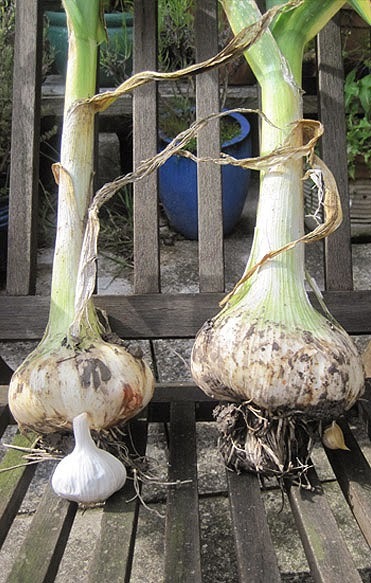 Today our blog contains some interesting facts about elephant garlic! Elephant garlic is quite a bit larger than ordinary garlic, and can even grow to the size of a large white onion (500 grams)! Each head of elephant garlic usually contains five cloves, each of which is larger than a normal head of garlic. Elephant garlic is planted in October and harvested in July. Also known as wild leek, this type of garlic shouldn't really be called 'garlic' at all. It is believed to be the ancestor of today's leek, and has a refined leek taste. It has a mild, delicate, slightly sweet flavour, making it ideal for use in salads. The garlic is very easy to peel, crush, and chop. Roasted elephant garlic is a true delicacy, and is also a very special component when fermented. Draw inspiration from the different types of garlic and, of course, from the new garlic chart available at Gastronomixs!